The Virginia opossum is the largest species of Didelphidae. This is the only marsupial that can be found in northern Mexico. Its range includes the United States, Ontario, Quebec, Canada to Costa Rica in Central America. It is hunted for its meat and fur. This animal is nocturnal omnivorous, feeding on fruits and seeds, insects and other small animals such as frogs, snakes, salamanders, birds, earthworms, insects and small mammals and carrion. It does not hesitate to go on the road to collect the remains of animals killed by cars, at the risk of its own life, or dumpster diving. In captivity it is cannibalistic and any injured animal must be separated from its congeners. It is lonely, social behavior is poorly developed. Males are more aggressive and may fight fiercely among themselves. 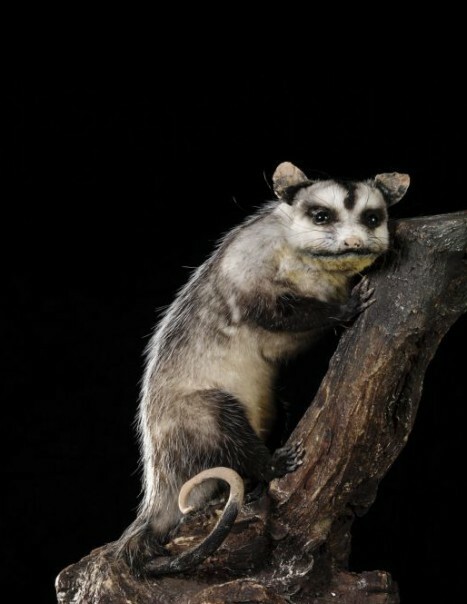 The Virginia Opossum measure between 65 and 85 centimeters in length, between 22 and 40 cm for its prehensile tail, with a weight of between 1 and 5 kg; giving it about the size of a domestic cat and making it the largest of all opossums. Males are slightly larger than females. Its fur is gray or gray-brown more or less dark on any individual, except the face and throat are white. The undercoat has a white base and a dark end, pale gray or white, exceeds the undercoat and gives the animal its unkempt appearance. Tail, remembering the rat, is stripped, long, cylindrical grip, allowing it to cling to the branches or carry small items. The ears are also bare; they are large, black with higher pinkish border. The head is elongated and the pointed snout bears long whiskers, the nose is pink. This animal has fifty teeth and, on the back legs, an opposable thumb and the other fingers are free of nail. The females have a marsupial pouch where small develop after birth. The Virginia Opossums have a longevity of 18 months on average, but the longevity record is 3 years in an individual freedom and up to 7 years in captivity. Possums breed once a year in the region of Canada and two to three times per year in the southern regions. The two annual breeding seasons are from late January to late March and from mid-May to early June. The range comprises 5 to 21 small, but generally 6 to 9, after a gestation period of twelve or thirteen days after mating. When they are born, small does not have eyes or ears apparent and their back legs are not yet developed. From birth, they have to climb from the genital area of ​​their mother until her marsupial pouch, where they cling to one of its eleven to thirteen teats. They will remain 50 to 65 days after birth clinging to the teats. They reach maturity at the end of their first summer or next spring at the age of 6 to 12 months, usually six months for females and 8 months for males. Life expectancy is 2 to 3 years.